The essentials of this serious matter are crystal clear so your decision to postpone dealing with it is unfortunate (see your message below) . Despite multiple good faith attempts within the system to mitigate the damage of proposed Library cuts by numerous interested parties over the past few months, you implemented a policy of dumping large numbers of books behind building 202 without proper notice to employees or lower-level management and without adequate safeguards to protect this incredibly valuable asset for the Center, the Agency, and its employees. Many dumpsters filled with books have already been lost (see attached photo taken this Wednesday evening) and these books/journals were not all duplicates or available on line. Had the Union, the Chief Scientist, and other dedicated employees not intervened to halt this process, the plan was to eliminate most of the book collection. 1) reschedule the Town Hall meeting so that management can hear the full range of employee concerns and clarify things, if you feel they have been mischaracterized. 2) commit publicly to the full preservation of the remaining Ames collection until the Library Committee and an appropriate set of discipline experts have a chance to issue written recommendations and the Ames community has a chance to comment on them. 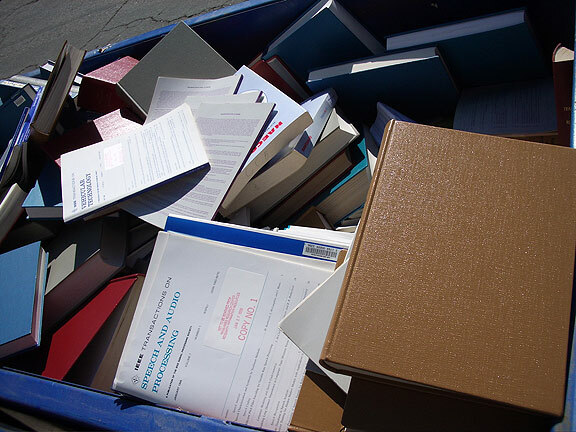 Lastly, if through the latter process it is determined that certain books or journals are unnecessary, surely there is a better way to deal with this then to simply dump them, e.g. there are Universities, Colleges, and employees who would benefit from IEEE transactions, if Ames has two copies or has an on-line subscription. The above requests are straightforward and reasonable. Instead of further delays, uncertainty, and conflict, management should quickly and publicly embrace a better plan for the future of the Ames Library System. Ames employees deserve a prompt and clear answer, not more stalling. P.S. If this is how management handles "Library Reshaping", I can hardly wait for the "Workforce Reshaping". We are sorry to inform you that due to several misunderstandings, it would be appropriate at this time to postpone the "Town Hall" meeting until matters can be clarified and resolved. We will reschedule the "Town Hall" meeting as soon as possible. Code J is requesting your attendance on August 16, 2005 to attend the "Town Hall Meeting on the Library Reshaping Plan" for N202 and N239. It will be held in the Main Auditorium of N201 from 2:00 - 3:00 P.M.
Code J would like to take this opportunity to achieve the following objectives: 1. Provide information on the decision making and the process that is being implemented to restructure the Main Library of N202 and the Life Science Library of N239 as becoming one, located in the basement of N239, room 53. 2. Provide an open forum for those individuals that would like to share their issues and concerns. By doing this we, in Code J, hope to understand the concerns of the Centers Researchers and to allay their fears regarding the future of the Library services and materials. A Centerwide e-mail will also be going out to invite all that are interested in attending so that they too can have the opportunity to ask questions and share their concerns.